An old treasure has been buried in Oak Island. Since the end of the 17th century to the present, various efforts have been made ​​to explore the treasures of Oak Island, but nil. Ancient technology once again proves how great what is considered ancient technology that can outwit we call 'modern'. A few days later with two friends McGinnis, John Smith (19 years) and Anthony Vaughan (16 years), began digging the hole. At a depth of 2 meters from the surface, they found a large stone tiles that covered the hole. Excavation then continued to do, and what they find next, reinforce their expectations if something precious had been hidden in the hole. At a depth of 10 meters, they found a layer ofoak logs and shaped to cover the hole. The same layers they found at a depth of 20 meters and a depth of 30 meters, a layer of wood shaped into a round that seemed to cover the hole. Because it was already no longer possible to continue the excavation to the size of 3 teenagers, they finally decided to go back home and think about planning to continue the excavations. They then left the hole for 8 years. Time they use to find someone or anyone who can help them both in the affairs of the funds and equipment. Not much they can find and try until about 1802. That year, Simon Lynds visited the hole and was impressed with the story of three companions. Simeon then formed a company specifically to handle the treasure digging holes. The company was named Onslow Company. With the help of a company, a depth of 30 meters that were previously excavated three teens with difficulty can be exhumed by a team of diggers with ease.Excavation then continued to a depth of 90 meters. They found each other protective layer depth of 10 meters. At a depth of 40 meters, a layer of charcoal to cover the hole, the 50-meter layer of a layer of putty, and at a depth of 60 feet a layer of coconut fiber that became the cover. At a depth of 90 meters (another version of history told at a depth of 80 meters), a team of diggers found a clue. A flat stone with a length of 3 meters and 1 meter wide that contain strange characters and odd numbers have become an another puzzle as well as an affirmation of the existence of something of value in the bottom of the hole. Excavation then continued. 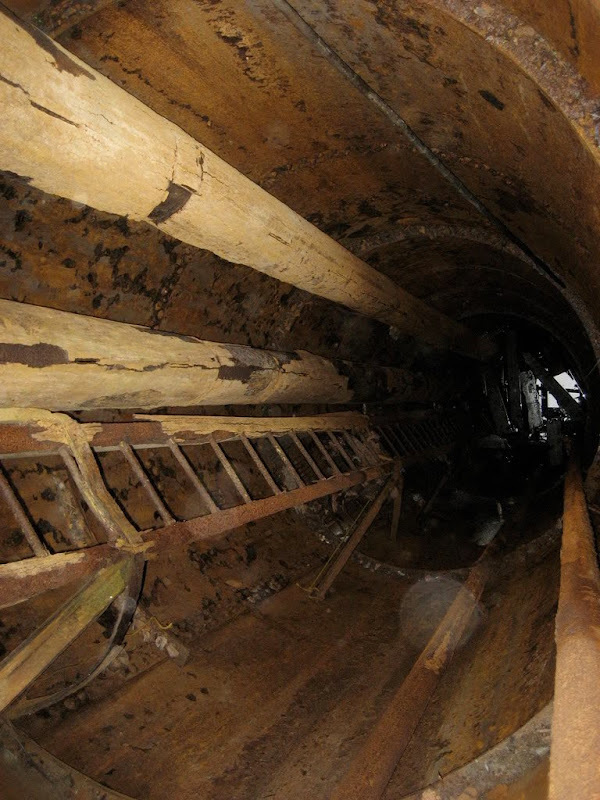 At a depth of 93 meters, the ground began to enter the pit was a layer of soft mud. Excavation was then stopped for the day when they reach the layer of soft mud. The next day when a team of diggers returned, they were surprised to find they have dug a hole filled with water as high as 33 meters. The team finally decided to pump the water out, but it was useless. Excavation and then resumed in the next year when it was decided to dig a hole that will be connected parallel to the first pit.But their efforts became futile when holes are made ​​in parallel began to reach a depth of 100 meters, the hole gets filled again with water. The project was eventually stopped and became homeless for 45 years. During this period, nothing else is doing the digging for treasure. 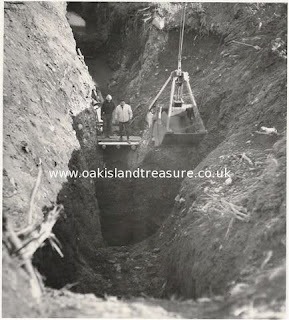 In 1849 then, The Truro Company is following the re trying to uncover the mystery of Oak Island mystery hole was. Team of diggers just try to dig to a depth of 86 meters, but due to stagnant water begins to return, the team conducted a speculation to make a core-drill holes before re-stagnant water. This drilling yielded an unexpected result. Drill at a depth of 98 meters found a layer of pine. Further drill continues to penetrate the deeper layers. The team from The Truro Company diggers then find 4-inch layer of oak. Next they found a 22-inch-thick metal layer, the next 4 inch layer of oak again and another layer of fir. In conclusion, they may have drilled a box or treasure chest made ​​of oak. When they lift their drill, the team found diggers oakwood chips and strands that look like leather palm. One of the drill also found a few strands of gold chain. As drilling continues, suddenly one of the crew found that the water in the hole turned out to be salt water and was rising to the top following the tide. This indicates if the designer of this hole has managed to make intelligent pitfalls that are designed to overwhelm the hole if one starts to find the treasure. Tim diggers back in 1850 with plans to dig a hole and parallel hole trying to reach these treasures through the hole parallel to be made. But nil. As before, when the hole began to touch the depth of 90 meters, the water flooded the entire hole directly parallel. Team digger and then pumping out the water that flooded the hole parallel. In the process of pumping out water that seemed impossible, a team member if the diggers found at low tide, there are other sources of incoming water, and salt water that indicates if the water comes from the coast. The team also examined the coastal barrier that became one of their digging, and what they find on the beach next was beyond common sense. The beach is man-made beach. Based on observations of the team excavating, an artificial beach has been designed in such a way to connect with the pit which is about 500 meters from the beach. Adri water channels according to estimates made ​​beach is connected with the treasure pit at a depth of 110 meters. For more details look at Smith's Cove Tunnel Flood. The next solution team from Truro Company diggers want to stymie the flow of water from the existing beach at the water line. They built a dam which will divert the flow of water from Smith's Cove Tunnel Flood, so there will be no water to be flooded pit when the water is pumped out. Unfortunately, a storm destroyed the dam which was built before the dam was finished. Truro Company finally succumbed to years It is interesting to note from the dam by the excavation team from Truro Company is, the team discovered the remains of the older dams when they build their dams. Oak Island treasure hunt later re-done in 1861 by Oak Island Association. The first thing a team of diggers from the OIA is to clean up the treasure hole to a depth of 88 meters. They then dig a new hole to the east. The hole is dug to the east is intended to try to find the treasure hole channel connected to the sea. After reaching a depth of 120 meters, a team of diggers finally canceled their plans because it did not find any one channel connected to the hole treasure. The new hole is then abandoned. The second hole is dug to find the treasures which are then dug a channel to seek this treasure to the west. When the second hole reached a depth of 118 meters, suddenly the water began to flood the pit, the same as occurs in the main pit Oak Island treasure. When the water began to flood the hole that suddenly collapsed down pit deeper than 15 meters, no one knows for sure how deep the treasure inside crumbling down. In the excavation of the OIA is the first casualties. But yan fallen victim not because buried in the pits, but because of the steam pump used suddenly exploded and injured the team is around to take its toll. Excavation is also ultimately failed to solve the puzzle channels Oak Island treasure pit. The project by the OIA was finally discontinued in 1864 due to run out of funds. Advanced search continues in 1866, 1893, 1909, 1931 and 1936. Search started using modern methods is then not also solved the mystery of the hole channels Oak Island treasure. Modern methods are used among others by detonating flood channels, making the dam that will keep the water will not meet the hole dug, and dug excavation using a crane (not manually anymore). The only of the modern ways that produce results that success closing the flow of water from Smith's Cove Tunnel, but this success only makes the other man-made waterways more flowing from the south. In 1936, Hadden Gillbert who collaborated with Fred Blair began a new investigation of Oak Island. This time their focus not only on the main pit, but to the whole island. They started looking for things that might be associated with these treasures. This investigation eventually found two important things. The first is the discovery of a carved rock at a depth of 90 meters from the hole dug for treasure, while the second invention is a piece of wood that allegedly was part of a major construction because it has a form that can be connected with other parts by using a pin (probably some kind of bolt). Until now, drilling continues. Drilling is currently commanded by Blankenship andBritons. Great discoveries came from the Briton and Blankenship, namely what is known as Borehole 10-X. 237-meter long steel tube, and submerged at a depth of 180 meters meters at the eastern edge of the sea. Below are some theories that circulate in the community about who the real owners of these treasures. Captain William Kidd - As a famous sailor, rumors about the treasure can not be separated from the Oak Island community conversation. Several legends about the treasure also refer to Oak Island. The French - the theory says if the owners of these treasures is the French who bury their money in anticipation of the defeat of the war a lot happens when fighting the British during the American colonization. The Vikings - Some public records also say if the Vikings had several times visited the United States. Although no one dares to affirm if these treasures belonged to the Vikings, but the rumors about them are also not free from the talk of society. Bands of pirates - Oak Island also has a lot to be famous pirate haven. This fact led to the theory of a new trust if the treasure was buried somewhere on Oak Island. Inca or Maya treasure - during the colonization of America by Europeans in the 18th century and 19th centuries, much of the wealth of the Inca and Mayan civilizations that disappeared. The theory then states if maybe some sympathy with Americans who are still buried treasure of the Inca and Mayan civilizations in a place like Oak Island. The stone has disappeared until now. Although it has significance for treasure hunters on the island of Oak, but some doubt the authenticity of the stone circles.Those who hold these stones would not hesitate to say if the stone may have been made ​​and abandoned by previous diggers in order to make the next diggers just more confused. Nonetheless, a professor of languages ​​at the University of Halifax in 1866, never tried to translate the script.